However, more important than this is Storyteller’s reliability problem. Storyteller decks are completely dependant upon having a Storyteller in their starting hand; while 4 Silvers and a Storyteller is a fantastic opener, 4 Silvers and a terminal is just a Big Money variant - slow and unimpressive. Even all of the strategies written in this article fall to pieces without access to a Storyteller in your opening hand. This makes Storyteller decks more prone to dud than other conventional draw engines. The best way to combat this is simply to have 1 or 2 more Storytellers than you’d otherwise need to fully draw your deck - having to play 1 or 2 Storytellers as cantrips every turn is well worth having a deck that runs consistently. 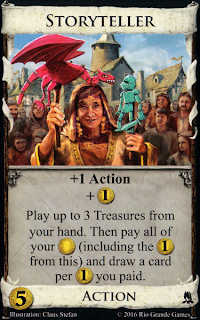 Bank is an especially notable example of this - any treasures fed to Storyteller count as ‘in play’, and therefore add to Bank’s total value while also helping you fill your hand with even more treasures to boost Bank! While this still takes some build-up without support, Bank-Storyteller can lead to explosive results when paired with +buy cards. Simply feeding 4 Storytellers 3 Treasures each puts all your Banks at $13 and counting, disregarding any treasures still in your hand! Platinum, while lacking any special effects, also deserves a special mention. Though expensive and hard to connect with Storyteller, Storyteller/Platinum provides near-unrivaled drawing power that can easily facilitate game-winning megaturns. At first glance, you’d think Storyteller would be a significantly worse card with no trashing - after all, it’s harder to align your Storytellers with your Golds with 7 Coppers and 3 Estates in the way. And while this is true, these 10 junk cards also apply to every other player in the game, no matter what cards they decide to go with. As well as using Silver and Gold to increase handsize, Storyteller’s Copper-to-cantrip effect lets you cycle through your Coppers if need be. While using Storyteller as a glorified Forum isn’t ideal, it makes drawing 4 Coppers and a Storyteller often preferable to drawing 4 Coppers and a Smithy. Overall, Storyteller is a fascinating and versatile card - its reliance on vanilla Treasures makes it at least a semi-viable option in any kingdom, though depending on its support and competition, Storyteller can be totally dominant, completely outclassed, or anything in between. While Storyteller decks build and play quite differently from anything else in Dominion, the classic rules of building and balancing a coherent deck apply just as strongly. Knowing when to go for Storyteller, along with how to build your deck around Storyteller, can spell the difference between an awkward pseudo-BM deck and a spectacular 20-card megaturn. I think a comparism to Stables is needed as both use treasures to turn into draw. When is which card better? I feel like this misses the point of Storyteller's reliability issue a little. Any engine will dud if it doesn't get any draw into the starting hand. The reason that this is more of an issue with Storyteller is that these decks are usually bloated with Treasures. I feel like the kingdom treasures section doesn't add a lot, especially since I never liked articles talking at length about specific synergies. It could use some trimming down, especially since the article is already a bit long. In the "Storyteller without trashing" section , I think you massively undersell Storyteller-as-sifting. Storyteller can cycle 3 Copper without reducing handsize and without putting those Coppers into your discard. That makes it usually better than Forum (though you'd want some Forums to handle the Estates). The fact that it doubles as draw makes it amazing. I would argue that Storyteller is even more relevant in engines that do not trash. I think you could focus some more on the importance of deck tracking. It is important as you play Storyteller to have a decent estimate of how many $ you need to feed to Storytellers in order to draw your deck. That's not always trivial, especially if your deck also contains cantrips or other forms of draw. If you overdraw with Storyteller, then that usually means you did something wrong. I like the article overall though! These were just points that I thought could still be improved. I think it's great to have an article on this because it is a difficult card to wrap your head around. The equivalence of paying and discarding breaks down after you shuffle. In other words, cards like Plaza and Stables make you want to (over)draw more than usual. For me, the basic maths of the storyteller is that you spend each coin to draw each card. If your deck is worth on average less than a coin, curses maybe, then a storyteller might be poor value for money (unless you do want storyteller to cycle rather than draw). As card quality goes up, the value for money goes up. All draw cards face this problem when considering their purchase cost but you have to consider this each time you play storyteller too. 'Virtual coin' is probably not the right term as it is just as real as any other coin. Trying to use coin from terminal actions with storyteller seems weak but I wouldn't discourage players from trying to build a fishing village-monument-storyteller deck if they want to. Sifters like cellar are good with storyteller both for getting the right type of cards in hand and use with big hand sizes. Card counting and deck memory are important with stoytellers. You have the most coins to spend if you can spend exactly the right number of coins on storytellers. You can't (without serious shenanigans) play any one card both to give Storyteller coin and to give you economy for your Buy phase. That's an either-or. To fund Storyteller, you need extra economy. But the more economy you add to your deck, the thicker it gets and the harder it is to draw Storyteller usefully. All too often, I've seen someone play Storyteller, play some Treasures, draw lots of cards, play another Storyteller, play more Treasures, draw the rest of their deck, then mournfully reveal they've only got $4 left to spend having sunk something like $10 into drawing. It would be good if the article could address that trade-off. This just sounds like a bad deck. I think the only time I've had this experience is in a game with Mountebank and no trashing. And Storytellers were still worth it to play Mountebank more often. This just sounds like a bad deck. Right, and this article should be about how to avoid that pitfall and build a good Storyteller deck. It's the opening, in which case Storyteller isn't much different from Stables or Laboratory (it cycles more, but slightly reduces economy). You have completely failed at Dominion fundamentals. A Storyteller article cannot help you. You are under very oppressive junking attacks. Stables is a little better in these situations, but not much. Really, if your deck is bad enough, Silver and especially Gold become better than non-terminal draw. A Storyteller article could mention oppressive junking, but it seems pretty low priority. Wasn't there a legendary Dominion League championship match that involved Storyteller+Possession? Storyteller could consistently draw Possession at the cost of any other payoff, which is exactly the kind of deck you want to build to defend against Possession. I think the kingdom also had Mining Village as the only splitter, LOL. Solid article, BTW. I agree with everything, although I think there should be less emphasis on specific synergies with kingdom treasures. One mistake that I used to see streamers make, was getting into the mindset that Storytellers are for sifting coppers, therefore they should only play coppers with it. For example, say you have a hand of Storyteller, 3 coppers, and a silver. Rather than playing 3 coppers, you should play 2 coppers and a silver, because that's like sifting four coppers, despite only having three in hand. That's my two cents. In general you should be paying the biggest treasure you have unless you would overdraw or would lose economy. Usually you are limited by either total storytellers in the deck or your access to the next one, and the best way to ensure you get them is to draw a lot early. Using Storyteller for Coppers is... fine, but then it’s essentially a cantrip Cellar - nothing special for a $5. I don’t really even like promoting “storyteller as copper sfter” at all, honestly - because it’s not really what the card is good at or why it is good at all, it’s just a thing it can do. I kinda made this point before about most of the "gainers" section, but I maintain most of it is just as true without Storyteller as with it. Particularly the part about Governor. Storyteller can help you play your Governors more, but midturn gain-and-remodel isn't the part of Governor Storyteller even helps with. Without some non-money effect you're trying to draw into, feeding Storyteller money is kind of value-neutral for your turn anyway, other than for cycling. So to me the claims that treasure gainers have some special utility for cycling or that shoving more silver/gold into the deck with gainers helps you get it under control because of Storyteller are a bit dubious. Without some non-money effect you're trying to draw into, feeding Storyteller money is kind of value-neutral for your turn anyway, other than for cycling. So even if your deck only consists of Silvers, Storytellers and Provinces and no cards that junk or provide extra Buys those Storytellers do something very useful. Right, I'm with you and Aku Chi's point that the your $ per card should be greater than 1, so the cycling/draw/whatever isn't useless by itself. I still think the way it's presented framed by gainers is misleading. Governor + Storyteller is amazing and I'm baffled that you don't see this. Storyteller is great in a Governor deck for the same reason that trashing is; the less you have to play Governor for draw, the more you can use it for payload and the less you help your opponent. We can play some Governor + Storyteller games sometime if you're interested. I mean Governor is a great card, yes. Being able to play your Governors other than for draw is also great, so it follows the two are good together, but Governor gaining gold and remodeling it midturn is not the part where Storyteller helps. Governor does that part just as well on its own. The only way you can, on net, decrease your economy by playing treasures to Storyteller is if your deck averages < $1 per card. Firstly, it's important to be clear that "deck" there means "cards you might draw", not the totality of cards you own. Things get more complicated if, say, you know the remainder of your draw pile is dross, but there's cool stuff in your discard pile. Secondly, it may be obvious, but spending more on Storyteller than you have cards left to draw is a pity. Thirdly, there are normally other ways on offer to draw cards. You not only want to boost your economy by playing treasures to Storyteller, you also want to do so better than the alternatives. Fourthly, there's the issue of variance. If your deck is 25% Platinum, 75% victory cards, your deck averages $1.25 per card. If you have a hand of Storyteller, Platinum, 3*victory, playing Storyteller and Platinum will on average increase your spending power from $5 to $7.5 . However, if you have a hand of Cellar, Platinum, 3*victory, playing Cellar and discarding your victory cards will on average increase your spending power from $5 to $8.75 . That suggests to me there are definitely deck compositions that are conspicuously bad for Storyteller and/or conspicuously good for alternatives. I emphasise I've not thought this through fully. I don't have answers. I just have questions I'd hope an article like this would answer. The reason he brought up Governor being able to Remodel into Provinces, even though it’s not extremely relevant to what Storyteller does, is that it provides further justification for the Treasure flooding that Governor enables. Additionally, Storyteller enables this strategic effect by providing a good source of nonterminal draw (that also deals with the Silvers you’ll get). This seems worth noting, I don’t really get why it wouldn’t be brought up? I totally disagree. DeepCyan has rightly pointed out that Storyteller likes Silvers and Gold gainers (even double Treasure gainers like Dismantle and Treasure Trove might be viable with Storyteller) precisely because she can turn the gained Treasures into (Double)Labs but that this doesn't imply that you cannot have too many Treasures in a Storyteller deck. DeepCyan also pointed out that for consistency / risk management reasons you should aim to gain "too many" Storytellers. For example when you play a normal engine you can soon reach the point where you want to get rid of Lucky Coin whereas a Storyteller deck reaches that point later or never. You seem to argue that this is not the case.